Mystic Match 'Em is a minigame in Mario Party 4. It can be played only by two players and is required to beat Boo's Haunted Bash in Story Mode. 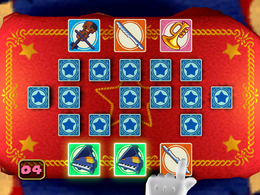 Each player starts with three cards, each with a different instrument on them. The possible instruments are a trumpet, a violin, a piano, and a flute. Taking turns, players first discard one card, which remains face-up on the table, then takes one of the remaining face-down cards, trying to match three like instruments. If a player picks one of the three Boo cards on the table, all the cards on the table and in the player's hand are reshuffled, and the player gets three new cards. The opponent's hand is left untouched. The first player to match all three of his or her cards to a single instrument wins. Boo – "In this game, you must find three cards with the same picture. First, find a card you don't need and press to discard it. Then, select one card from the table, and press to pick it up. When your turn ends, then I'll go. Whoever can match three cards of the same picture first wins! Each of the 4 cards has its own instrument. You may match any you want. However! If you pick one of three "Miss Cards"... Then all the matching cards you hold will disappear! So, you must be very careful when you pick your cards!" 3 mai soroero! Match 3 cards! Italian Tris e venci! Trio and win!